This album is inspirational for more than just the superb quality of the music-making. It's a testament to the friendship between two great artists . . . It's also poignant, of course, because this was to be the last time they played together . . . [the Orchestra Mozart] play so well for him on this [album] . . . with Argerich's help he bids farewell with performances of the highest quality. Partnering Martha Argerich once again, together they give exhilarating, productive and sophisticated accounts of two of Mozart's greatest piano concertos . . . [Mozart 25]: Abbado leads off with a regal and journeying introduction. Argerich's reply is impulsive but also very responsive to Orchestra Mozart (a mix of talented youngsters and world-renowned musicians), delighting in the brilliance of the writing and also relishing the sublime melodies . . . The slow movement is lovingly shaped and the finale's friskiness and profundities are respectively scintillating and eloquent. To the very different "Sturm und Drang" world of the D minor Piano Concerto, Argerich, Abbado and the eponymous Orchestra bring a surreptitious scurrying to the opening movement, fortissimo outbursts all the more powerful for the restraint elsewhere, so too Argerich's opening out the dynamics in the development section. She plays Beethoven's cadenzas in the outer movements, and does so with a cutting-loose zing. For all the music's dark passion there is also much heartfelt expression on offer. Such contrasts also abound in the 'Romanza' slow movement, gently songful for the most part yet with a central storm, which Argerich and the woodwinds whip up. The finale is electrifying, faster than most, prestidigitation and attack to the fore yet without losing focus on the music . . . these are imposing, beguiling and charismatic accounts, with a few subterranean noises off and applause retained, that have been vividly recorded and can be highly recommended.
. . . overwhelmingly beautiful. Argerich digs deeply into the keys, but never makes an ugly sound. Her subtle shaping with Abbado of the central movement in the D minor concerto is slow but serene, and the way she lifts the final simple phrases of the coda is heartbreaking. An outstanding partnership between Claudio Abbado and Martha Argerich with the Orchestra Mozart creates a performance which is elegant, electric and compelling . . . Mozart was in Abbado's very DNA, a fact that is highlighted here in the elegance, élan and well-harnessed energy in his moulding of the orchestral parts of these two keyboard concertos. The artistic partnership with Argerich is an intimate, seasoned and spirited one: the way in which her delicate fingerwork in the slow movement of the C Major Concerto is so perfectly coordinated with the woodwind instruments is just one example of how the orchestra, soloist and conductor are in complete, responsive harmony. But on the broader front, too, this is a performance where everything works instinctively. Argerich, as always, is a characterful, spontaneous soloist but, as is equally typical of her winning manner of playing, she is thoroughly attuned to the music's scale and stylistic niceties. With Abbado as a constant source of sensitivity as regards balance and instrumental colour, this is an interpretation that is in every sense live and, with excellent engineering of sound, has a compelling immediacy of presence. The atmosphere of tension and apprehension that Abbado triggers at the start of the D Minor Concerto fuels a viscerally exciting, aptly disquieting performance of the first movement, its emotions in flux, Argerich complementing Abbado in tempering darkness with light. She launches the finale as a true "Allegro assai", but it is fit, healthy and lithe rather than in any way breathless. These are performances in which vital sparks generate palpable electricity. A disc of Mozart piano concertos recorded in concert by Martha Argerich with Claudio Abbado and Orchestra Mozart was always going to be a delicious prospect . . . Argerich surpasses herself. The backing of the exquisitely refined Orchestra Mozart grants full rein to her personal brand of expressivity. Every note matters, both individually and as part of a phrase, and once again her microscopic alterations of touch make even the most mundane run of semiquavers dance and sing, imparting something undefinable and treasurable to her performances here . . . the grandeur of [the C major in] Abbado's introduction contrasting with the spirited filigree of Argerich's solo contribution. She is fully alive to the darker undertow of the D minor . . . Argerich sets off with a will in the finale but doesn't let herself get carried away in the Romanze's central convulsion, sticking firmly to the tempo of the gentler outer sections. Where she does let go the full power of her virtuosity is in the cadenzas . . . Familiar, perhaps, but rendered almost hallucinogenic when refracted through the prism of her unique musical imagination . . . Argerich with Abbado, then, is a surefire winner and a suitable memorial to the late conductor.
. . . [Piano Concerto no. 25 K. 503]: Argerich's entry in the finale suddenly emerges like an Indian summer, dazzling and lively, darting in and out of the orchestral texture . . . [Piano Concerto no. 20 K. 466]: this performance is at its best when the music is at its most intense, the climaxes of the first movement and the finale building up a good head of steam, but always with a sense of reflection rather than "sturm und drang" . . . [Argerich and Claudio Abbado bring to their Mozart performances] the cares of life, creating music of consolation and philosophy, deliberation and calm, laudable, if today rather unglamorous, attributes, which Mozart's genius can accommodate.
. . . Abbado offers conducting that is precious, fussy, and overly timid in both works, especially their first movements . . . the finales of both works, or the minor-key eruption in the Romance of Concerto No. 20, reveal both her sensitivity and virtuosity to fine effect . . .
. . . Argerich can play like the wind . . . [the recording] flirts with perfection and delivers satisfaction at its deepest . . . In both concertos, this is late-life Mozart from musicians . . . who have lived with it across their entire careers, and the wisdom gleaned from those decades informs every note and gesture -- and still is worn lightly. From Abbado there's the wisdom of accumulated, deeply considered historically informed performance, which came into ist own before his very eyes and ears. From Argerich, there's the attention to every crystalline note and the lunge into its fullest, deepest possibilities that the best of modern pianos can underwrite. From both is unwavering devotion to Mozart. Argerich properly lets loose in the cadenzas . . . and spontaneity and at times even impulsivity illuminate her playing . . . Abbado, otherworldly in the D minor, encapsulates a life in music theater in the broadly smiling C Major.
. . . two stunning live performances . . .
. . . a peerless team . . . [Concerto no. 25]: This is a really fine performance, with impeccably judged tempos in all three movements, and great playing from the Orchestra Mozart . . . [Concerto no. 20]: Argerich's playing is full of both unforced poetry and eloquence, as well as commanding authority where needed . . . [her performance] has an expressive intimacy that is refreshingly effective . . . Argerich's every phrase is invested with such distinct character that the music never sounds too plain . . . Deutsche Grammophon's engineers have done these live performances proud, with a natural-sounding balance . . . a splendid disc, and a fitting memorial to Abbado . . .
Martha Argerich and Claudio Abbado -- a match made in heaven . . . [Argerich receives such fine and seamless accompaniment] from Abbado and his own hand-picked Orchestra Mozart. In the C major, Argerich uses an idiomatic cadenza by her former teacher Friedrich Gulda and that, together with the rest of her performance, is in a class of its own. 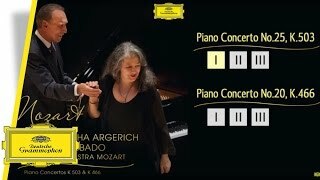 There cannot be a finer performance of this concerto out there, and not a better memorial to the Abbado/Argerich partnership.
. . . [Argerich] gives a magisterial performance, with many interesting and unusual insights, teasing out the hidden detail in Mozart's music. "K503" is one of his biggest most extrovert concertos, and she is equal to every demand. The demonic "K466" is likewise impassioned and powerful, and Argerich conveys its strength and pathos with unflinching command. The late Claudio Abbado and the Orchestra Mozart are with their distinguished soloist every step of the way, and DG's live recordings sound spacious but incisive. Two greats combine forces for Mozart in one of the outstanding releases of the year so far. It is so rare to have conductor and soloist on absolutely the same wavelength, and when they are two great artists, as here, the result is magical . . . In K. 503, Abbado's orchestral exposition is properly celebrational; Argerich's response is delicate in the extreme. Her cadenza (by Friedrich Gulda) is the perfect choice for her reading, restrained and exquisitely shaded. Argerich's ornaments in the Andante are beautifully playful, the whole movement chamber music of the highest order. The Allegretto finale is a perfect balance of sprightliness and tranquility . . . [Piano Concerto no. 20 K. 466]: the sense of two great artists at the top of their game is palpable. The determined energy oft he finale is perfectly judged from all sides. Argerich has recorded both of these works before, but this disc sweeps all before it.
. . . these live performances of beautifully balanced Mozart concertos bid a poignant farewell to a collaborative partnership that had begun fifty years before . . . [Mozart 25 / 2nd movement]: Flautist Jacques Zoon and bassoonist Daniele Damiano share the warm spotlight with Argerich, who graduates her colors with suave finesse . . . ["Allegretto finale"]: a rondo tune of remarkable, contrapuntal plasticity . . . [Mozart 20]: What always astonishes us in this concerto is Mozart's uncanny fusion of abysmal visions with the charm of rarified beauty, the ability to see the Divine Comedy in the midst of a militant Inferno. Argerich does not skimp of potent "bravura", especially in her octaves and runs, culminating in the blazing Beethoven cadenza that graces a striking decision by Mozart to end this tumultuous movement softly . . . [2nd movement]: the music maintains from Abbado a healthy walking tempo, not mired in histrionics . . . [Beethoven cadenza]: Argerich plays as if she were performing chunks of the "Appassionata". Then bubbling woodwinds and superheated strings accompany Argerich to a nobly affectionate "coda", which marks more than the "mere" closing of a magnificent artwork.
. . . Martha Argerich [is] one of the most brilliant pianists of modern times . . . with the right colleagues in chamber music and the right conductor in concertos, reined in just a bit, Ms. Argerich is often incomparable. She has an ideal colleague in the conductor Claudio Abbado . . . The performances of the Concerto No. 25 in C and No. 20 in D minor are phenomenal, with Ms. Argerich's vibrant, colorful, imaginative playing held in check just enough by the masterly conducting of Abbado, who draws exciting playing from the festival's Orchestra Mozart. The magisterial C major Concerto, K. 503, is dominated by an elegance one associates with Abbado in the autumn of his career. Balances within the orchestra are exacting, the winds getting extra prominence . . . What's common to both [concertos] is the superb playing of the Bologna-based Orchestra Mozart and the effortless interplay between the two principals. The D-minor Concerto (K466) is especially fine and the Beethoven cadenzas make you wonder 'isn't this how "he" might have sounded?' . . . I admit to straining not to miss any strands of what Claudio Abbado and his Bologna orchestra were doing. Argerich und Abbado vermeiden starke Kontraste, stattdessen erlauschen sie quasi das Innenleben jedes einzelnen Tons und jeder Phrase und bringen so die Musik zum Leuchten. Man muss keine Schwanengesang-Melancholie in diese kostbare Scheibe hineingeheimnissen, um entzückt wie ergriffen zu hören, wie hier . . . zwei Könner völlig entspannt in die Mysterien und Verführungen dieser Musik hineinhören. Wie sie sich neugierig mitreißen lassen und dabei stets souverän die Kontrolle behalten. Wie sie sich gegenseitig Aufmerksamkeit und Respekt schenken, wie sie aufeinander reagieren und den anderen gewähren lassen. Wach, liebevoll, mit Spaß am eigenen Können und den so entfesselten, kristallinen Klängen. Ja, so klingt Mozart-Transzendenz.
. . . [das] Dokument einer langen, wunderbaren Künstlerfreundschaft . . . Das Gespann Abbado-Argerich ergänzt sich traumwandlerisch darin, einander der Musik auszusetzen, ohne den nur allzu gut vorgekerbten Wegen dann auch folgen zu müssen. Das entfacht bei Mozart besonders nachhaltige Wirkung, gerade weil Offensichtliches einfach unterspielt wird: die Pracht des C-Dur ebenso wie der den Don Giovanni vorwegnehmende Todessturz in d-moll. Mozart wird zum Medium des Übergangs, eines gemeinsam über Grenzen hinaus Spürens, ein Seismograph. Es erscheint nur folgerichtig, dass Claudio Abbado seinen stillen Wagemut nur noch mit Freunden auf dem Podium teilen mochte. Ihm und der furchtlosen Martha Argerich dabei folgen zu dürfen, durch Mozart-Fragen, Mozart-Volten, Mozart-Erstaunen, lädt diese Aufnahme vielfach ein. Eine Grabplatte ist das nicht. So etwas nennt man wohl: ein Geschenk. Mit dem von ihm gegründeten Mozart Orchestra hat Abbado einen sehr transparenten, von der historischen Aufführungspraxis inspirierten, wunderbar abgeklärten Mozart-Stil entwickelt . . . [Piano Concerto no. 25 K. 503]: [Argerichs] Temperament kommt schnell zum Tragen, doch wie beherrscht und delikat spielt sie diesen Mozart! Im d-Moll Konzert Nr. 20 exponiert Argerich das berühmte Romanzenthema nicht überdeklamierend wie die meisten Pianisten (danke! ), sondern natürlich fließend, dabei samtweich und klar zugleich -- und das Orchester bildet, wie von Zauberhand geführt, Rahmen und Gegenpart. Für diese Aufnahme kann man einfach nur dankbar sein. Claudio Abbados letzte Aufnahme schließt einen Kreis und rundet sein reiches diskographisches Erbe auf bezeichnende Weise ab . . . Er hat sie mit seinen Orchestern auf Händen getragen: Martha Argerich . . . So wie Abbado und Argerich stets Vertraute waren und über Jahrzehnte blieben, agieren beide auch in diesen Konzerten: in bestem Einvernehmen, einander zuhörend, sich gegenseitig ergänzend und animierend. Argerich mit einer bis ans Trockene reichenden Klarheit, Abbado mit zurückgenommener Geste, um all seinen Solisten, im Orchester wie am Klavier, die besten Klangmöglichkeiten zu eröffnen. Wo sonst das d-Moll-Konzert als kleiner Bruder des "Don Giovanni" gedeutet wird, besitzt hier alle Schwere etwas Vertrauensvolles, ja Tröstendes. Zu hören ist besonders im C-Dur-Konzert KV503, wie Abbado in höchstem Maße kammermusikalisch denkt und dirigiert, auch da, wo Mozart durchaus repräsentativ ins Klavier greift, wie es Martha Argerich wunderbar deutlich macht. So wird es zum Ereignis, wie sich die Klaviertigerin nicht etwa zurücknimmt, sondern sich dem Geist Mozarts so überlässt, dass ihr Klavierspiel gleichsam mit Orchester und Dirigent intim dialogisiert . . . ein denkwürdiges Dokument für Claudio Abbados Vertrauen in Mozarts helle Kraft und Martha Argerichs immer dynamische Klavierkunst.
. . . [Claudio Abbados Dirigat] lassen den Hörer schlichtweg den Atem anhalten. Und die als erstrangige Interpretin virtuoser romantischer Klaviermusik hinlänglich bekannte und geschätzte Martha Argerich entpuppt sich hier als eine Künstlerin von derart traumhafter Idiomatik der Wiener Klassik, als hätte sie nie etwas anderes gespielt. Zwei Künstler, die sich seit Jahrzehnten kennen, die völlig intuitiv aufeinander reagieren, die nicht nur alt, sondern altersweise geworden sind, zeigen uns einen vollkommen natürlichen Zugang zu dieser scheinbar bekannten Musik, die doch immer wieder unerhörte Facetten offenbart . . . Martha Argerich interpretiert diese Meisterwerke mit Leichtigkeit und Eleganz des Anschlags, mit einem trockenen Staccato und wie beiläufig aufblühenden Passagen, technisch makellos, ohne dabei im Geringsten virtuos aufzutrumpfen; im Gegenteil, sie nimmt sich wohltuend zurück, tritt hinter das Werk und lässt es gleichsam von selbst erklingen . . . Abbado erzielt mit dem vorzüglichen "Orchestra Mozart" nicht nur eine restlos selbstverständlich wirkende Balance zwischen den Instrumentengruppen, auch wenn er die Holzbläser, durchaus angemessen, ein wenig bevorzugt, sondern vor allem auch jenen leicht melancholischen Klang der späten Mozart-Werke, der hinter der spielerischen Gelöstheit eine menschlich-tragische Dimension aufscheinen lässt, wie sie gerade bei Mozart nur ganz wenigen Interpreten zugänglich ist. Historische Aufführungspraxis oder modernes Instrumentarium, diese Frage wird hier [gleichgültig] . . . dies ist eine Sternstunde der Mozart-Interpretation, ein Vermächtnis, das uns Claudio Abbado nur noch schmerzlicher vermissen lässt. Vital ist das . . . im agogischen Detail meisterhaft ausgeformt. . . . Ein beeindruckendes Vermächtnis der Zusammenarbeit zweier der herausragendsten Künstlerperönlichkeiten unserer Zeit. Die innige Vertrautheit zwischen den beiden Ausnahmekünstlern klingt auch in ihrer letzten gemeinsamen Live-Einspielung für die Deutsche Grammophon durch . . . [aufgeführt mit] Frische und Lebenslust . . . In Mozarts heiterem letzten Wiener Konzert C-Dur K 503 von 1786 vereinen sich in dieser Aufnahme Argerichs fast kindlich-unbeschwerte Spielfreude und Abbados elegant fließendes Dirigat auf so natürliche Weise, dass die Musiker unweigerlich auf einen Höhenflug mitgenommen werden. Abbados Credo des Aufeinander-Hörens und Musizierens unter Freunden haben alle ganz offenkundig verinnerlicht. Im ständigen Wechsel zwischen Dur und Moll tritt das Klavier virtuos hervor und bleibt doch immer Teil eines organischen Ganzen . . . Nach dem schwärmerischen Andante treten im letzten Satz Allegretto Klavier und Streicher in einen schwungvollen Dialog, dem sich auch die hervorragenden Holz- und Blechbläser anschließen. Das ein Jahr vorher komponierte Konzert d-Moll K 466 beginnt unruhig und düster, verliert durch die mitreißende, transparente Interpretation jedoch alles Bedrohliche. Martha Argerich tanzt mit ihren Fingern förmlich über die Tasten, so perlend hat man Beethovens Kadenzen in diesem Stück selten gehört. In dem zweiten in B-Dur stehenden liedhaften Satz Romanze wird sie von den übrigen Musikern einfühlsam begleitet, bevor sich im Rondo Solistin und Orchester nochmals in einem abschließenden übermütigen Reigen vereinen . . .
[Eine der] besten Aufnahmen des Jahres 2014 . . . Ein Kreis schließt sich: Kurz vor Claudio Abbados Tod musizierten die beiden alten Weggefährten noch einmal traumhaft miteinander . . . Sensibler und subtiler denn je zuvor geht die Argerich hier auf die behutsame, quasi kammermusikalische Erschließung der beiden Partituren durch Abbado ein . . . Das pure, elektrisierende, unmanieriert-dramatische, natürlich fließende Mozartglück. Ein Vermächtnis.
. . . [K .503:] [une] paire de rêve . . . le maestro pare l'allegro de majesté, mais par le souci du détail de chaque pupitre, il le préserve de toute épaisseur et lui confère un étonnant relief. Autour de cet orchestre riche en timbres, Argerich nous conte une histoire en quelques notes. Sérénité, lyrisme, inquiétude: autant d'états d'âme de l' "Allegretto" se succèdent en l'espace de quelques mesure. Ses phrasés et sa sonorité (on n'insistera jamais assez sur les couleurs et les accents incroyablement changeants de son piano), bondissants et allègres, sont la vie même. Parfois, un trait à la main gauche ou un accord arpégé se détache fugacement et apporte un éclairage inédit. Les caprices, les foucades d'antan (qui avaient, ô combien, leur charme) laissent désormais place à une douceur sensuelle et une imagination canalisée. [K. 466:] Le début du "Concerto en ré mineur" déroule une ambiance presque surnaturelle: a-t-on souvent entendu ici des basses aussi légères, tout en rebond? . . . Le cocon idéal de la "Romance" se fissure en son milieu, délivrant une cavalcade pianistique plus fantasque que dramatique. Le final enchante par ses échanges chambristes. Le dialogue entre la flûte et le basson s'impose comme un délice. Quelle émouvante surprise que cet enregistrement! . . . On savait l'entente entre les deux musiciens parfaite, fruit de cinquante années de baguenaudage artistique commun; cela frappe d'emblée à l'écoute de cette prise de son "live" . . . Tout ici est délicatement équilibré, simplement ludique, à la fois sensiblement et intellectuellement caractérisé. C'est un juste milieu entre l'apollinien et le dionysiaque . . . le deuxième mouvement du "K466" devient tendre mais jamais suave; le troisième du "K506" une ode spirituelle à la grâce mélancolique mozartienne sous la forme d'un sourire. La cadence du 25e a été écrite par Friedrich Gulda, choisie par sa disciple Martha, et boucle la boucle symbolique d'amitiés musicales sur le long cours qui semblent inspirer ce disque . . . [Orchestra Mozart]: la précision de ses pupitres est un précieux atout dans le discours concertant. Il fait davantage office de héraut pour mettre en valeur une ultime fois cette complicité humaine et musicale réunie ici au plus haut niveau artistique.